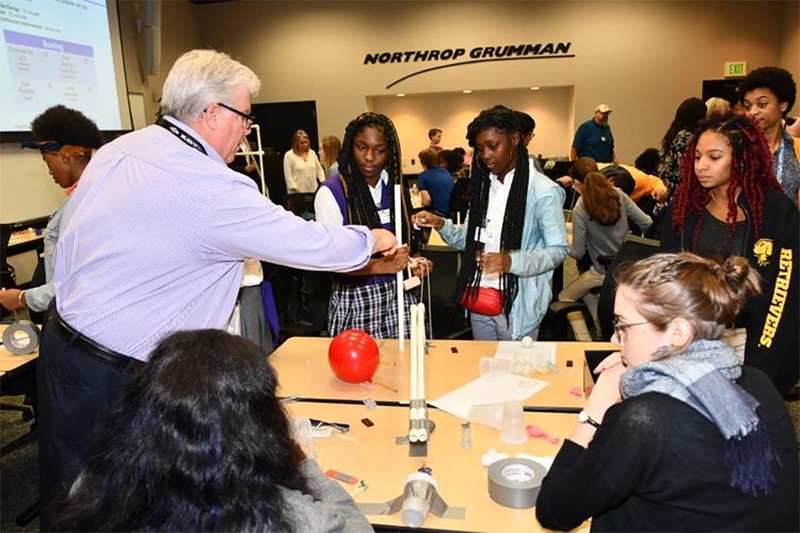 As part of Manufacturing Day, leading global security company Northrop Grumman welcomed STEM students from Baltimore Leadership School for Young Women to its BWI campus in Baltimore. Along with students from two other schools, the women were able to meet and talk with Northrop Grumman employees about the work the company does. As manufacturing becomes more advanced, it requires skilled, creative STEM-literate workers and Northrop Grumman want to encourage today’s students to consider careers as manufacturing assemblers, technicians and engineers. On the day, armed with a kit of materials such as PVC piping, duct tape and magnets, students had to work together to create a solution to flip a light switch and illuminate a light emitting diode (LED light). The students had great fun completing the challenge and learning how to work as part of a team. Northrop Grumman offers internships in a number of areas including engineering, project management, business and cyber. Each enables students to learn new skills, explore the company, network with experts, connect with leaders and leave with a CV that opens doors. Search and apply to find the latest internship opportunities and other exciting job opportunities with Northrop Grumman.